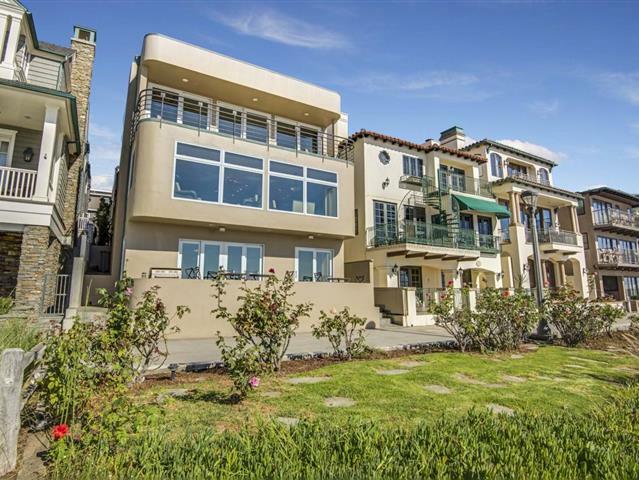 This North Manhattan Beach Strand home provides the perfect opportunity to entertain as well as relax while listening to the waves break on the beach. Depending on the time of year, you'll enjoy stunning sunsets over the ocean or the Santa Monica mountains from every level of this luxury home. The entrance provides an in-ground spa with courtyard area before you walk into an open floor plan featuring a kitchen with stainless steel appliances and granite countertops as well as a family room with large, new windows allowing for panoramic ocean views. The downstairs bonus room boasts a beautiful bar, bath, and TV entertainment area that opens to an elevated deck area with a built-in gas bbq. Upstairs you will find a spacious master suite with breathtaking views from Catalina to Malibu and another large deck. In addition to the main house, there is a guest house or income apartment over the garage with two bedrooms and one bath. Time to experience ocean front and beach community living.